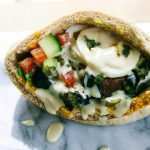 While spending your gap year in Israel there is no doubt that you will frequently enjoy the massive amount of delicious street food that can be found right across the country: falafel, shawarma, sabich, burekas and more western food such as pizza and burgers. However, on occasion you will certainly be cooking at home and while you are sure to want to make some of your regular favourites it can be fun to experiment with local cuisine. The most basic of all Israeli foods has to be Israeli Salad. It is quick and easy to make and even those with no prior experience in the kitchen are sure to find it a doddle. 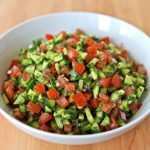 In its most basic form the salad contains tomato, cucumber, peppers, onions, herbs such as parsley, lemon juice and salt and pepper. The salad couldn’t be simpler to make, just dice the vegetables as finely as possible, place them all in a large bowl and add lemon juice, olive oil, salt and pepper. While this may not be enough to constitute and entire meal, it is an excellent side dish no matter what you’re eating. 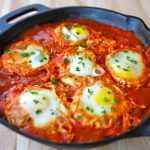 Shakshuka is a hugely popular meal in Israel. It is a tomato and egg dish that can be quickly and easily made at home and is extremely filling. To make it you need to fry chopped garlic, paprika and cumin in olive oil then mixed in some canned tomatoes and salt. Cover this with a lid and let it simmer for about quarter of an hour and then make some pockets in the sauce and crack eggs into them. Cover the pan and let it cook and after about five minutes you will have a delicious hot meal. Sabich is essentially an egg and eggplant sandwich that can be bought at most shops selling falafel. However, there is no reason you can’t make it at home, especially considering how cheap the ingredients are in Israel. You will need to roast eggplant slices covered in olive oil and plenty of salt and pepper. This will take about 20 minutes and is the most complicated part of the process. Then you just make an Israeli Salad (as described above), boil some eggs, and then put it all together in some pita bread. Be warned, while it doesn’t sound like much it is extremely filling. If all of the above sounds like a bit too much work then don’t worry, there are easier options. In the freezers any supermarket in Israel you will find a food called Malouach. 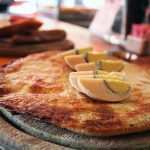 Malouach is essential wafer thin slices of buttery dough. All you need to do is buy a pack, keep it in the freezer and whenever you are hungry, quickly fry one. It takes just a few minutes and they are delicious. Malouach is most often served with a tomato sauce, but there’s no reason you can’t eat it with anything you want, such as cheese or hummus. Another advantage is that they are very filling and a great thing to line your stomach with before a night out. 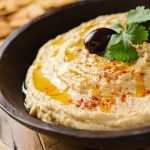 It’s impossible to write about Israeli food without mentioning Hummus but be warned, hummus isn’t that easy to make and there is plenty of excellent hummus readily available wherever you are. Nonetheless, it can be fun to try and make your own and the ingredients are very straightforward. You will need dried chickpeas, baking soda, tahini, lemon juice, garlic and salt. First soak the chickpeas in cold water (preferably overnight) and then fry them for about three minutes while stirring. Add some water to it and let it boil. You will then need to cook it for about 40 minutes before draining it. You then need to blend it into a paste and add the tahini, lemon juice and garlic. Obviously you will need more details to follow these recipes but a quick search online will provide you with all the details you need.